ANAHEIM, Calif. (February 5, 2011) – Team San Manuel Yamaha’s James Stewart, of Haines City, Fla., led tonight’s Monster Energy AMA Supercross, an FIM World Championship, race at Angel Stadium wire to wire, en route to his third victory of the season before a 45,050 fans. Despite breaking his left pinky finger in practice today, Monster Energy/Pro Circuit/Kawasaki’s Josh Hansen, of Elbert, Colo., won his third Western Regional Supercross Lites class main event and extended his championship points lead to eight over his teammate, Broc Tickle. Stewart led the field through turn one and began to distance himself from the field in the Supercross class feature. Monster Energy Kawasaki’s Ryan Villopoto rode in the number-two position for all 20 laps of the main event. TwoTwo Motorsports’ Chad Reed, of Tampa, Fla., finished third. 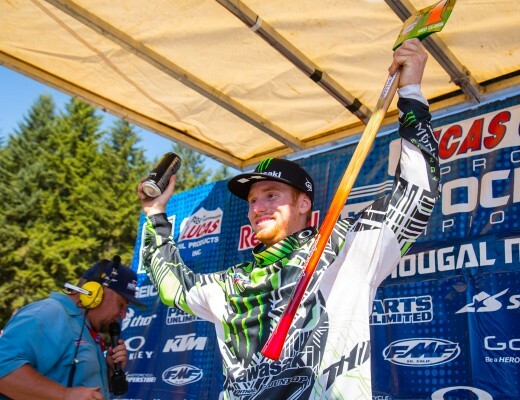 Stewart extended his championship points lead to five over Villopoto. Defending Supercross class champion Ryan Dungey did not finish tonight’s race due to a mechanical failure. Hansen and Geico Honda’s Eli Tomac and Red Bull KTM’s Ken Roczen carved their way through turn one with just inches separating them to start the Western Regional Supercross Lites class main event. On lap two, Roczen moved around Tomac, but five laps later, Tomac returned to the number-two position. Tomac and Hansen traded places for the lead on lap 10 before Hansen used an aggressive move to secure the lead and ride to his third race win of the season. Tomac finished second and Roczen finished third, marking the first podium of his career. SPEED will broadcast the Supercross Lites class at 5:00 p.m. EST followed by the Supercross class at 4:00 p.m. EST on Sunday, February 6. Racing heads to Houston’s Reliant Stadium next Saturday. For more information on the Monster Energy AMA Supercross, an FIM World Championship, please log on to www.supercrossonline.com. For all media requests, please contact Denny Hartwig dhartwig@feldinc.com or 630-566-6305. To follow Monster Energy Supercross on Facebook and Twitter, log on to www.facebook.com/supercrosslive and twitter.com/supercrosslive.